What is on the Amicus18 board? The Amicus18 board uses the Microchip PIC18F25K20 microcontroller, which has 32768 bytes of flash memory, 1536 bytes of RAM, and operates at 64MHz. The dimensions of Amicus18 board have been kept exactly the same as the Arduino so that the massive number of low cost shields that are available for Arduino could also be used with the Amicus18 board. All the I/O pins of the microcontroller are accessible through on-board female header pins. Remember that several I/O pins of PIC18F25K20 microcontroller are multiplexed with an alternate functions from the internal peripheral modules, such as ADC, PWM, comparators, USART, I2C, and SPI. The functionality of an individual pin can be chosen out of these many through software. The figure below shows the layout of the components and headers on the board. The header pins are labeled very well on the actual board for easy identification. Communication with the Amicus18 board is through an USB interface, which presents itself as a standard serial port on the PC. 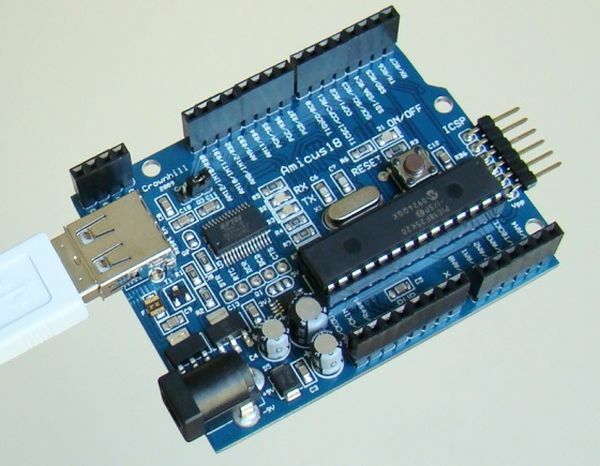 The preloaded bootloader (which occupies the very top 128 bytes of the program memory) allows you to program the microcontroller directly through this port. However, if the need arises, an ICSP (In Circuit Serial Programming) interface is provided on the board to program the microcontroller with an external programmer. The board contains USB A-type receptacle (not very standard), which means you need A Male to A Male type USB cable to connect the board to the host PC. It is important to note that the PIC microcontroller provided with the Amicus18 board is 3.3 V type, which means the logic high I/O voltage is also 3.3 V. This allows the Amicus18 board to directly interface with modern devices like 23K series SPI RAM, SD/MMC card, and ENC28J60 (Ethernet controller), which all operate at 3.3 V. However, it could be an issue while interfacing with some other devices that strictly operate at 5 V. Most 5 V devices might accept 3.3 V as logic high input, but their 5 V outputs may not be acceptable to the I/O pins of PIC18F25K20, as they are not tolerant to this voltage. So care must be taken while doing so. For example, writing to a 5 V HD44870 based character LCD module is OK, but reading data from the LCD could be harmful to the PIC18F25K20 I/O pins. In such a case, if reading data from the LCD is not important, the R/W line of the LCD should be permanently grounded so that the LCD data pins could never output data. 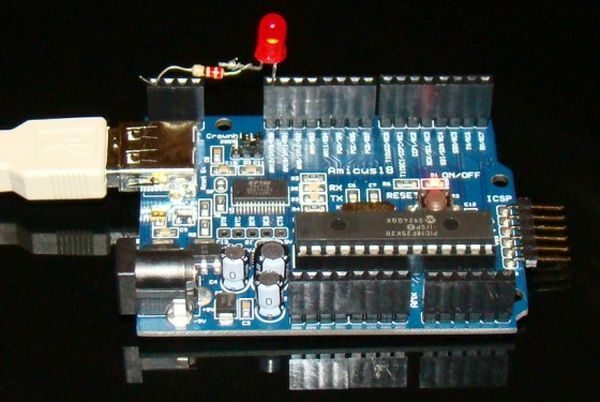 The same issue could also limit the usage of some of the Arduino shields that strictly operate at 5 V. While the Amicus18 board provides a regulated 5V supply on-board to power those shields, that does not guarantee that the direct interface between the I/O pins of the 3.3 V and 5 V devices would be reliable and safe. So, if your design strictly requires to be operated at 5V, you can replace the on-board PIC18F25K20 PIC device with another pin-compatible 5V PIC. Yes, you can do that but the key thing here is you may lose the programming support of the Amicus18 IDE. The Amicus18 IDE contains Crownhill’s powerful Proton BASIC compiler specially adapted for the Amicus18 development platform. This special version of the Proton Basic compiler is free and has no restrictions or time limits. It originally supported only PIC18F25K20 and so if you want to replace it with, say, PIC18F2550 (which is a 5V device and pin compatible with PIC18F25K20), you have to use a different platform (MPLAB or any other compiler) for firmware development and require an external programmer (such as PICkit) to program the chip. If you do so, the Amicus18 board is just like any other PIC development boards, except it has the form factor of popular Arduino. To me what seems to be the most important aspect of Amicus18 is the free version of the fully-functional and powerful Proton Compiler as well as the bootloader application, which are bundled with the Amicus18 IDE. Crownhill people also realized this thing and recently updated the Amicus18 compiler, providing additional support for PIC18F25k22 device, which is simply a 5V version of the PIC18F25K20 microcontroller. By default, the Amicus18 board comes with a PIC18F25K20 microcontroller. If you replace it with PIC18F25K22, you also need to correct the connections at Pad Q1 on the board (read the Amicus18 hardware manual) to provide +5 V (instead of 3.3 V) to the new PIC processor. However, I haven’t seen any official announcement on Amicus page so far regarding the bootloader support for PIC18F25K22, which means if you choose this device you still need an external programmer to load the HEX file into its program memory.